As a Microsoft Silver Certified Partner, we build not just an app but an incredible experience. Intelegain provides excellent solution services in .NET development for web, mobile, enterprise and Cloud. .NET technology one of the best platforms for building robust, secure, and scalable web or desktop applications. It offers clients a fully-functional, feature-rich solution, complete with the intuitive user experience. Intelegain is one of the top ASP.NET development companies that delivers reliable .NET solutions that cater to the needs and objectives of your businesses. Why choose Intelegain as your .NET development company? Intelegain is a Silver Certified provider of Microsoft technologies. We are a leading name as one of the top ASP.NET development companies in offering powerful and secure development solutions using the .NET platform. The abilities of our highly skilled and proficient development team speak for themselves and are very well admired and applauded by our clients. Our developers hold instrumental expertise in cutting-edge technologies associated with .NET platform. We maintain a strong .NET unit that includes full-stack ASP.NET developers and Microsoft Certified Professionals- which include MCTSs, MCPDs and MCSDs. Intelegain’s team of .NET developers for hire not only have the professional technical expertise to develop high-end ASP.NET web applications, but they have extensive experience of doing so for a wide range of industry verticals and sectors.  We as the leading .NET development company have developers in our team that are available in flexible engagement models to create the most scalable and flexible .NET solutions. Being a certified Microsoft Gold Partner, we employ only the most outstanding MS certified developers and professionals on board. Our dedicated .NET developers for hire are proficient at creating exciting applications with secure and maintainable code. We have full-cycle .NET delivery competencies that extend from product implementation, design & development to on-going support and optimization. Our team of certified net developer makes sure the readiness of your project to quickly embrace transformation entailed by changing market demands as all .NET projects are supervised by certified scrum professionals. .NET technology, for decades, has been used successfully in the business world efficiently and proved its reliability and convenience. It facilitates the creation of wide-variety of apps suitable for any platform type or any device. Plus, being owned by one of the best IT company, it inspires confidence in getting the corresponding high-level quality of the product. Our team of Microsoft certified .NET experts is capable of understanding and transforming varied business requirements into greatly flexible and scalable .NET web-based solutions that will revolutionize your business. By leveraging our expertise on Windows Presentation Framework (WPF), our customers succeed in getting apps with rich and interactive UIs. Intelegain lets you utilize the potential of WPF across the following: WinForms, Third party controls, Customized designs and controls, Asynchronous Data and message processing and Smart clients. We at Intelegain have a fair proficiency with ASP.NET Application Development Services, the nucleus of Microsoft technology for web application development. With ASP.NET, we develop and deliver high-performance, secure and reliable applications for our clients. Our services for ASP.NET web development include: ASP.NET MVC, ASP.NET 5, ASP.NET WebForms, SPA using Angular/ Knockout, Reporting using SSRS and customized templates using XML/ XSLT, SharePoint and Visual Studio LightSwitch. One of our specializations includes customization and integration third-party .NET solutions that full-fill your business requirements. Our third-party .NET customization services include API development, UI functionality and maintainability improvement, technical support etc. The .NET framework can be utilized for the development of mobile applications (both native and hybrid) as well as mobile responsive website designs. The Windows Phone Development Tool can be used for developing uniform apps across all the windows platforms. Next, cross-platform mobile apps can be built using Xamarin and Visual Studio Tool – Apache Cordova. Our ASP.NET developers for hire have the competency and the ability to help businesses integrate and manage their .NET solution in almost any development environment. We can manage the most complex of .NET applications and effortlessly deploy and scale them to the cloud. We can run your app in Azure (which is the best PaaS for .NET); although we can run your solution on any PaaS and deploy it on a hybrid cloud as per your app scale. Business leaders know that constant technological change can weaken the business value of legacy systems- thus, we deliver a broad range of services that seamlessly migrate your existing applications to .NET and improve its performance. Intelegain provides the following .NET migration services: Legacy to .NET migration, ASP to Latest ASP.NET Frameworks [MVC / Webform] Migration, Older ASP.NET WebForm Application to Latest ASP.NET Frameworks [MVC / Webform] Migration etc. Why Hire .NET Developers at Intelegain? Our ASP.NET developers for hire adopt well-defined strategies and use their grass-root level knowledge and experience in dealing with diverse types of projects for clients coming from various industry verticals- so that you can achieve your business goals effectively, cost-effectively and well within the deadline. As certified Microsoft Gold Partner, our developers are exceptionally familiar with all the latest version of MS technologies and ensure that clients get incomparable solutions matching their business requirements and objectives. If you are looking for an ASP.NET Development Company for any of the services mentioned above, then we wholeheartedly welcome you for our expert assistance. Get in touch with us today!